At Thanksgiving and all year, historians and cooks are finding new inspiration in records of yesterday’s kitchens. From the cover of “Science in the Kitchen,” published in 1893. In 1796, a self-described orphan named Amelia Simmons published a slim cookbook “calculated for the improvement of the rising generation of Females in America.” Now considered the first American cookbook, “American Cookery” took British cooking methods and applied them to the ingredients of the New World, including cornmeal and squash. But the book is striking for another reason, too: Simmons’s pumpkin pudding baked in a crust is the ancestor of the classic Thanksgiving pie. And her recipe for roast turkey—a North American bird—suggested stuffing the bird with bread and herbs, and then serving it with cranberry sauce. It was the first time the combination, now so central to this holiday, had been suggested in print. The return of these volumes represents more than just new life for your mutton leftovers. It’s the latest evidence of a rediscovery of American cookbooks among both historians and chefs. Scholars in fields like culinary history and food studies are working alongside a thriving community of food professionals and amateurs, all of whom find cookbooks an invaluable window into daily life in yesterday’s kitchens. “As cultural documents they’re extraordinary,” historian and law professor Sandra Sherman, who has written frequently about cookbooks, explained. “We learn about the 18th century by reading Jane Austen, and we learn about the 18th century by reading cookbooks.” As researchers pay more attention to these grease-spattered guidebooks, they’re unveiling a surprisingly lively, emotional, and even political world. At the time, the way cookbooks offer historians a rare glimpse into both aspiration and daily practice was only just becoming clear. Consider how Martha Stewart, say, offers both practical advice and fantasies of a more glamorous life. Similarly, old cookbooks hint at how American families actually lived—the tools they had available, the ingredients they favored—and what they valued, be it frugality or fanciness. Research into culinary history began to take off in the 1980s, and the last decade or so has brought a wave of new research into cookbooks. Now, the Schlesinger Library, along with Michigan State University, the University of Michigan, New York University, and others, house serious and growing collections. Specialized projects including Feeding America, an effort to digitize a trove of historic American cookbooks, have made many old texts widely available. These resources are being used by scholars interested in what happens when cultures urbanize, why we believe certain foods are good or bad for us, agricultural history, attitudes toward colonialism, how the poor eat compared to the rich, and beyond. 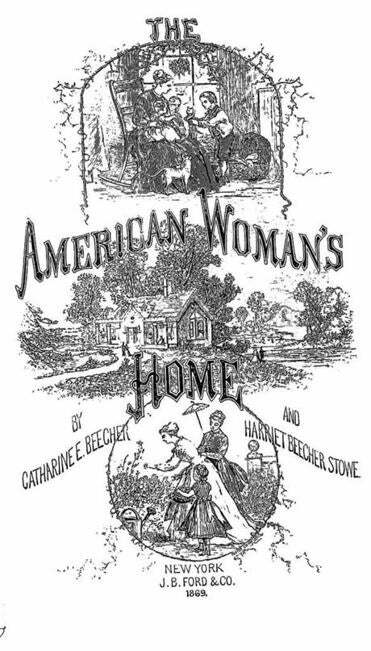 The title page of “The American Woman’s Home” by Catharine E. Beecher and Harriet Beecher Stowe, published in 1869. If cookbooks give historians insight into cultural moods, they also help trace conversations and public arguments, especially those conducted by women, who traditionally had few such outlets. 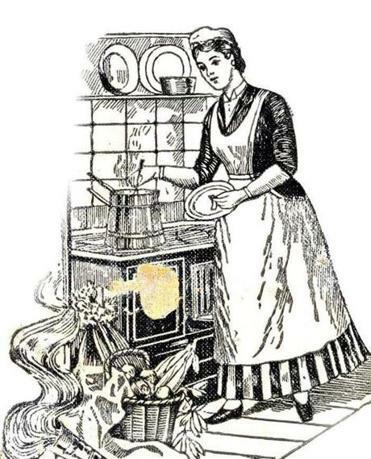 Many 19th-century cookbooks interspersed recipes with household hints and civic appeals; Massachusetts reformer Lydia Maria Child’s 1829 “Frugal Housewife” advised, “There is no subject so much connected with individual happiness and national prosperity as the education of daughters.” Some entire books were explicitly works of activism. Jan Longone, a pioneering cookbook collector whose stash forms the basis of a culinary archive at the University of Michigan, curated a 2008 exhibit of 19th- and 20th-century “charity cookbooks” that women produced to raise funds for causes including suffrage, education, temperance, and a huge variety of local causes. Of course, culinary historians have also turned a critical eye to ingredients, recipes, and eating habits, including the traditional Thanksgiving meal. This includes the menu at the “first Thanksgiving” in 1621, which looked quite different from the meal we enjoy today; according to researchers, it may have included lobster, but nothing made with wheat or sugar, unavailable at that time in the Colonies. As Veit put it, “People weren’t having apple pies, that’s for sure.” Our modern conception of Thanksgiving as a national family feast day would not be born for two more centuries. In the 19th century, prominent magazine editor Sarah Josepha Hale lobbied to make Thanksgiving an official “Union Festival of America”; Abraham Lincoln declared it a national holiday in 1863. In a sense, the new interest in vintage cookbooks arises from that same nostalgic spirit—tantalizingly, they promise to help rescue what we fear we’ve lost. But they also offer us more. For historians, they’re a snapshot of past domestic and political habits and perspectives. And for some cooks, they’re simply collections of tried-and-true recipes. Scott Herritt, a Boston chef, spent $10,000 on vintage cookbooks while researching the menu for Kitchen, his new South End restaurant that reproduces old-timey recipes like lobster thermidor; he even includes each recipe’s year on the menu. “The old book, the smell of it, the thought of it used to be in someone’s kitchen, or that someone in 1747 chose to go out and buy this book and that they took that on themselves—for me, that’s part of what cooking’s about,” Herritt said. His Thanksgiving menu, an homage to the idealized 1621 feast, will include venison, duck, wild turkey, cod, and squash. Amelia Simmons would approve.